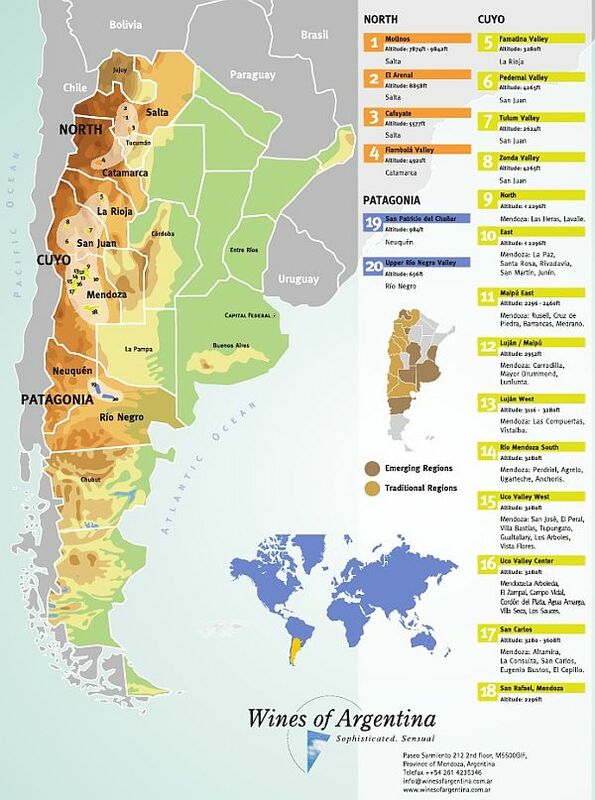 Certain regions of the world are well-known for producing exceptional wines. Burgundy producing Pinot Noir, or Napa Valley producing Cabernet Sauvignon for example. There is usually something about their terroir that brings out the best of their grapes, which then makes it into the wines. What is it about Argentina that makes Malbec special? There are a few factors: altitude, climate, and soil. Some may also say that water and the new generation of winemakers also contribute to Argentinean Malbec’s quality. From Mendoza north to Salta, the elevation at the foot of the Andes mountains increases from 300 to 2700m, with vineyards planted at all elevations. Altitude contributes to a variety of microclimates with varying intensities of sunlight to ripen the grapes. The more intense sunlight has caused the Malbec grapes in these areas to form thicker skins, which provides more tannins and deeper colour to the wine, as well as affect the aromas and flavours in the wine. The climate in Argentina, on the eastern slopes of the Andes mountains, is very dry. As weather moves from west to east, from Chile, clouds with moisture are pushed up the western slopes of the mountains which causes the clouds to precipitate by rain or snow, so that when the clouds come over the mountains and down the eastern slopes of Argentina there is no more moisture. Plus as the clouds move downslope, the air is compressed; compression generates heat so that the Argentinean vines get warm to hot, dry air flowing over them. This helps to keep out fungal diseases that thrive in cooler, damp conditions so that Argentina can more easily produce organic wines. When you drive through a mountain range you notice that the higher mountains tend to be bare rock, with vegetation in the valleys. Vegetation can only grow successfully up to a certain elevation, known as the “tree line”. Higher elevations plus leeward slopes (e.g. the eastern Andes) results in low rainfall and increased exposure to solar radiation, which dries out the soil, resulting in a localized arid/desert environment. With the lack of vegetation in these areas of Argentina, there is little organic material to enrich the soil. The soil is basically decomposed rock from the mountains. This lack of organic matter leads to restricted vine growth. The lack of nutrients and dryness of the soil affects the flavour development of the grapes. The quality of Argentinean Malbec has increased as the winemakers learn more about the terroir and use best practices in the winery. The world has noticed. In 1993 there were only 10 exporting wineries in Argentina; in 2017 there are now 424 exporting wineries (there are 881 wineries in total). 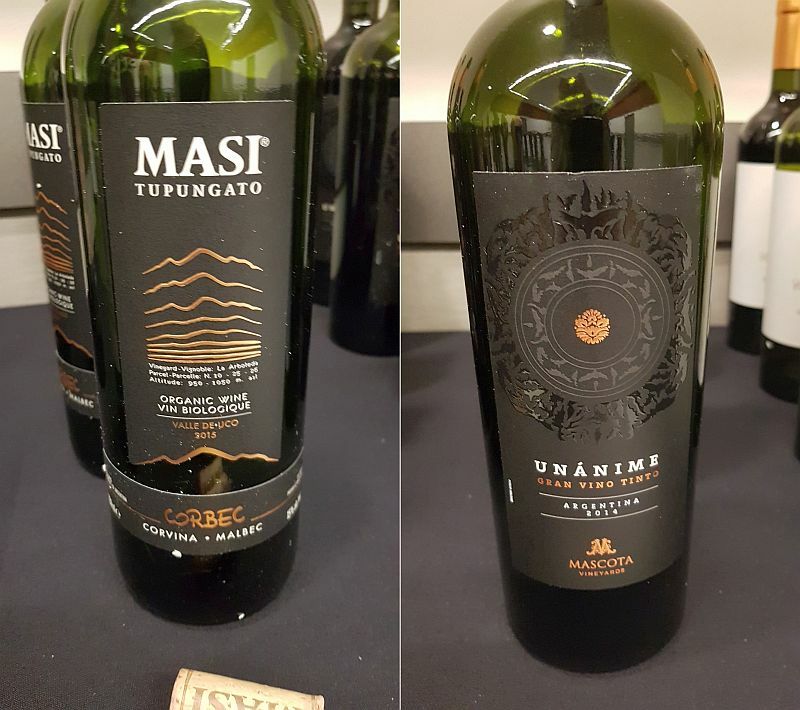 Total wine production of Malbec and other grape varieties has grown as well from 25 million litres exported in 1993 up to 273 million litres in 2017. Cooler regions will tend to show more red fruit character while warmer regions will show more spicy and herbal characters. 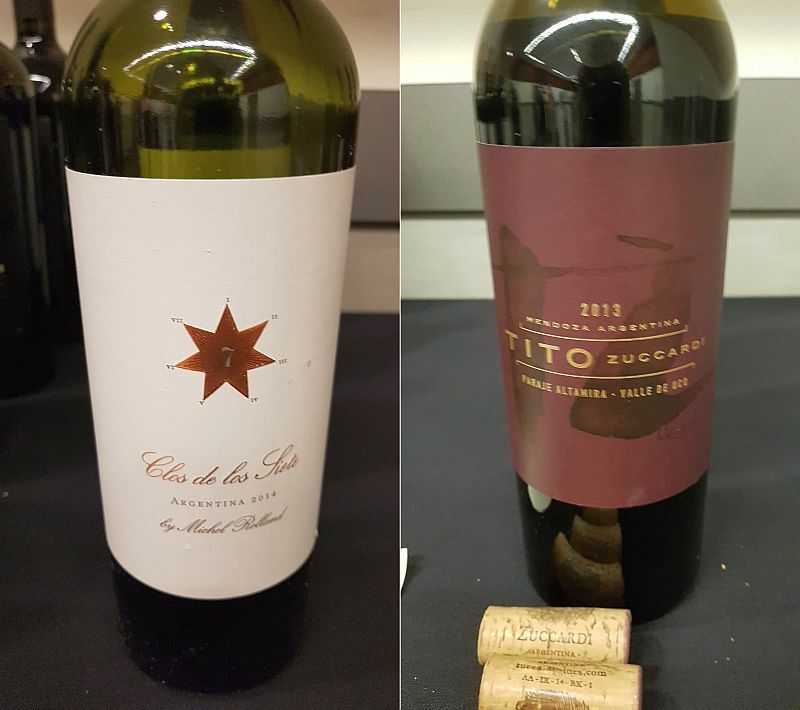 I and other trade people had a chance to try a flight of Argentinean Malbecs to see the differences of terroir on the wine, as well as to recognize the quality of the wine produced. As you may know, I was once the Coordinator and Cellar Master for the South World Wine Society in the 1990s. I distinctly remember a tasting we had of Argentinean Malbecs. From that tasting, I could easily pick out a glass of Malbec easily as the wine was a very distinct ruby colour. Fast forward to 2018, with the flight of wines in front of me, I did not see a ruby coloured Malbec; they were all deep garnet in colour. I asked speaker and winemaker Marcelo Pelleriti about this change in colour. He paused then noted in the 1990s Malbec wines were produced from grapes that were from a higher tonnage and could have been somewhat diluted to give the ruby colour. He said that now, viticultural practices are more stringent, producing small tonnages and winemaking practices are more stringent, which could be the reason for the garnet colour. Bodega Colomé Estate Malbec 2015 ($35.99) – Opaque garnet in colour. Ripe black fruit and cassis aromas. Fuller body with round mouthfeel. Flavours of ripe black fruit, some prunes and raisins, along with pepper. Bright acidity. Bodega Catena Zapata Alta Malbec 2015 ($54.99) – Opaque ruby garnet. Allspice, ripe black fruit and a hint of smoke or tarriness on the nose. Dry, ripe and round in the mouth. Rich black fruit flavours with allspice and nutmeg spices. Medium acidity with very soft tannins. Bodega Luigi Bosca Familia Arizu Malbec Terroir Los Miradores 2015 ($35.99) – Medium plus garnet in colour. Medium intensity nose with cedary, Old World oak, vanilla and ripe dark fruit aromas. Dry, full body with firmer tannins and some minerality. Dark fruit flavour, sweet spices and a touch of cedar. Medium acidity. Elegant. Malbec can also be blended with other grape varieties. Red blends are a hot category in the United States. Here are four red blends that I enjoyed at the tasting.